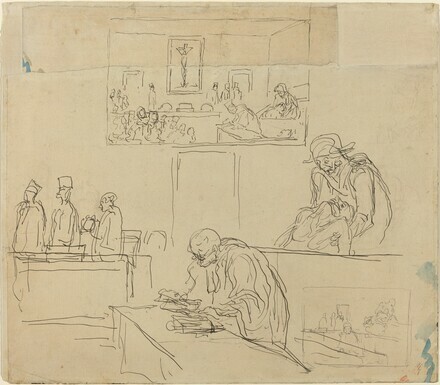 Daumier: 1808-1879, National Gallery of Canada, Ottawa; Galeries nationales du Grand Palais, Paris; The Phillips Collection, Washington, D.C., 1999-2000, no. 292, repro. (shown only in Ottawa and Washington). Daumier (1808-1879): Visions of Paris, Royal Academy of Arts, London, 2013-2014, no. 76, repro. Baudelaire, Charles. Les dessins de Daumier. Paris, 1924: pl.13. Maison, K.E. Honore Daumier: Catalogue Raisonne of the Paintings, Watercolors, and Drawings. 2 vols. Greenwich, CT: New York Graphic Society, 1968.